The Game Boy has been going strong for over decades and Gunpei Yokoi's original creation has made old Nintendo a lot of money. Although the Game boy was the undisputed king of the portable gaming world back in the 1990's, it should be noted that even though it released way back in 1989 that it wasn't the first of its kind. The 1970’s have a lot first when it comes to video games and that includes the first ever portable gaming unit with interchangeable cartridges. That honour goes to another game system. 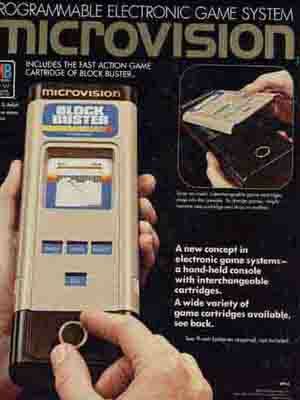 Introducing Milton Bailey's Microvision, a portable unit that was designed by famous video game genius Jay Smith. If the name Jay Smith sound familiar to some of you then he is also known for creating the Vectrex, another ground breaking video game system. Moving back to the Microvision itself, it was an innovative little Liquid Crystal Display device that came to the scene way back in 1979. Ten years before the Game boy would even debut. The Microvision differs from the Game boy in many ways. First the system itself has no real micro processor, it uses a simple 16 x 16 bit map technology and this means the games consist of simple black blocks rather that anything detailed plus the system also takes a couple of 9 Volt batteries (the ones that are fun to lick) instead of the standard AA type. Secondly, the Microvision has a roller dial on the bottom that was common place in games like Pong. The roller dial played an important role in most of the games because quick movements were key to survival. Another odd thing about the MV games is that they are actually long plates that have there own microprocessor, button configuration, and overlay screen. These games attach right to the front on the system. The problem with some of these games is that some of them play very much a like. For example: Microvision games like Block Buster and Pinball are virtual identical because they play very much like the classic Breakout game. Bottom-line: The Microvision may be the first ever portable game system but times have changed and the portable systems of today just have more to offer. I love the fact that this was the first but a 1979 portable unit with only 11 games can only entertain the masses for so long. What makes a bad purchase for the average gamer, it makes a great buy for the person looking for a collector’s item though. This system is even easy to get on online auctions since the prices are fairly reasonable but be careful because I can easily see them jumping in the future. Be sure to look out for this great little piece of history, you just might be surprised how good it really is despite its old age. Rating: 27/100 if you love simple games then give this a shot but this is no Gameboy! Rare Scale: 4/10 surprisingly this system is very inexpensive if you look on Ebay, just don't expect to see too many units there though.